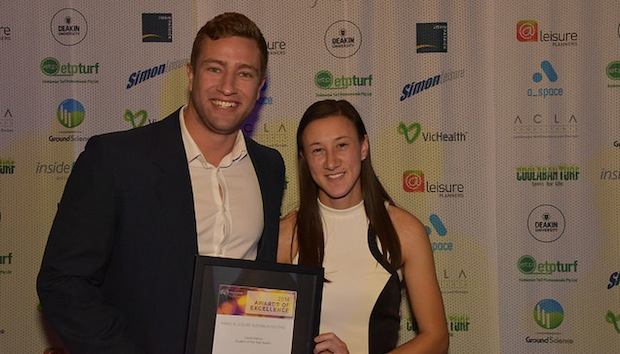 Parks and Leisure Australia’s (PLA) Awards of Excellence are returning this year, and are seeking nominations for some of the young achievers’ awards. Each year, PLA acknowledges initiative and innovative efforts of the ‘people behind the places’ that make up a community- our parks, gardens, council areas and sporting fields. Two of the awards are specifically for young people working within the wider parks industry; the Student of the Year award, and the Emerging Leader award. Recognising the efforts of young people’s work is of the utmost importance; for lack of a less-clichéd statement – they are the future of the industry. Also, showing young people that a career path such as landscaper, groundsman or greenkeeper can be recognised and rewarded when hard work is put in, is great initiative for those young ones in the wings still deciding on where they want to work when they leave school. A spokesperson for PLA’s Vic/Tas region says they are on the look out for more nominees for the two awards directed at young people. Vic/Tas has not received any nominations for the Student of the Year award so far, and there were also no Vic/Tas for the Emerging Leader Award last year. Named in honour of the late Dr. David Aldous (a recipient of the Frank Stewart Distinguished Service Award), the Student of the Year Award recognises and celebrates exceptional contributions made by those studying a relevant and recognised qualification in the sector throughout Australia. Finalists will receive a ticket to this year’s Awards of Excellence Gala Dinner held on the Gold Coast, plus a night’s accommodation and return flights to the event. The winner receives a 12-month Parks & Leisure Australia membership. Nominees can be self-nominated, or chosen by a third party who is an active Parks & Leisure Australia member. Last year’s Vic/Tas Student of the Year finalist was Laura Shaw. Taking on an internship with the City of Greater Geelong last year, Laura has now secured a full time position as the Recreation Services Officer with the City of Maroondah. The overall winner of the Student of the Year Award was Isaac Middle from Western Australian. Isaac is a student and sessional teacher at Curtin University, undergoing Doctoral Studies in Urban and Regional Planning. The Emerging Leader Award is specifically for young or emerging professionals less than 30 years of age. The award recognises those who have made a significant contribution to the parks and leisure industry. Finalists will receive a ticket to this year’s Awards of Excellence Gala Dinner held on the Gold Coast, plus a night’s accommodation and return flights to the event. The winner of the Emerging Leader Award receives a 12-month Parks & Leisure Australia membership, as well as a trip (including flights and accommodation) to the New Zealand Recreation Association (NZRA) National Conference, held in November 2018. Last year’s Emerging Leader Award winner was Tilman Lowe, a Senior Sports Development Officer from Nyoongar Wellbeing and Sports in Western Australia. Tilman was recognised for his love of sport and commitment to helping people realise their full potential. Nominations are currently open, but are closing fast! March 24 to be exact. If you know someone who has earnt their stripes in the industry so far, or think you deserve a pat on the back yourself, head to the Parks & Leisure Australia website, to find out more and submit a nomination. Best of luck to everyone, we can’t wait to meet the finalists!